Don’t you hate modern cinema audiences? I sure do. People are constantly chatting (without whispering), checking their phones, crunching crisps/popcorn as if they’re chowing down on nails…more often than not, it’s hell going to the cinema. That hell becomes Biblical if you’re going to see a horror film on a Friday night soon after its release. Regardless of my feelings towards Hereditary, for example, the largely teenage audience was not ready for a film like it. They jeered, chatted, screamed and guffawed throughout it. Where are the ushers to shush them, I wonder? 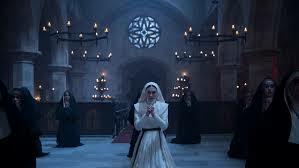 However, my experience of The Nun was perhaps the shining example of well-behaved teenagers and a visible usher (well, at least for the first fifteen minutes or so). Me and my fiancee’s brother-in-law were seated for half 8, bearing in mind that the film was supposed to start at 8:40. The cinema was half empty by 8:40. I breathed easily, for there was nary a teenager in sight. However, mid-way through the trailers, what seemed like thousands of teenagers poured in. No exaggeration, there must have been thirty of them. Most of them didn’t look fifteen. I feared the worst, ready to endure mindless chatter and silly screams throughout The Nun. Unusually, as the horde of teenagers surged to the front of the seating area, an usher appeared. He checked each person’s tickets. The manager joined him, they exchanged a few words, and the usher remained, keeping a close eye on the legion of teenagers. Be prepared for nuns jumping out of the darkness…because at least 70% of this film is just that. Now, in my experience of modern day cinema going, an usher presence is unique. Usually, they hang around to make sure those in Premier Seats are in possession of the relevant ticket, and disappear as soon as the film starts. But this usher harked back to the golden age of cinema going. The film started, and almost immediately, the light chatter began among the teenagers. Light from mobile phone screens was visible as well. This usher, this hero without the cape, was quick to rush over to the legion and had a quiet word with them. It was so quiet that I couldn’t hear it, but whatever threat he used worked. From that point on, the group of teenagers were very well-behaved. Of course, they screamed at the jump-scares, and whispered amongst themselves occasionally, but the words of the usher must have stayed with them. Nary a peep popped out of them for the duration of The Nun. Considering the mediocrity of The Nun, that’s saying something. I guess I’d better start reviewing The Nun, but my interest in the audience far outweighs my interest in The Nun. Simply put, there’s not much to say about The Nun. It’s the fifth film of The Conjuring franchise, and at this point everything feels and looks the same. Annabelle: Creation was an exercise in pointlessness, and the same applies to The Nun. However, this time they put extra jump scares in there! Forget about building atmosphere and tension, The Nun relies on tired tropes and nuns appearing out of nowhere to attempt to scare you. When will Hollywood understand? Jump scares do not make a horror film. They are effective if used in moderation, but what’s scarier is atmosphere and what we don’t see. I thought Taissa was Vera’s daughter…but nope…they’re sisters! It’s all held together by a very good performance by Taissa Farmiga as Sister Irene, who’s obviously taken acting lessons from her sister. Like the girl who played Linda in Annabelle: Creation, she outshines anyone else on the screen. Her performance, combined with some occasionally great visuals, almost make The Nun worthwhile. I found myself speculating more about Sister Irene’s connection to Lorraine Warren than anything else that occurred in The Nun. Is Sister Irene supposed to be the younger version of Lorraine? Are they related in any way? That unanswered question delighted me when, for example, the cast decided to split up yet again to find something or other. It may be a postmodern trope to comment on splitting up a group in a horror film, but why do it twice in one movie? Especially when the first time almost got someone killed. 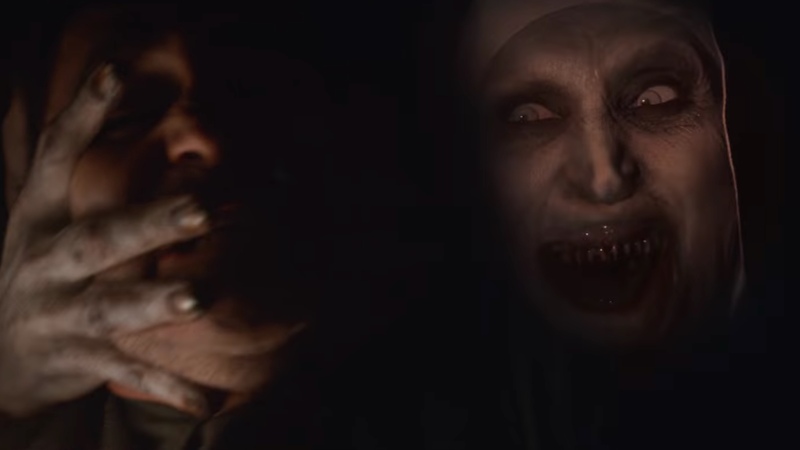 When you’re thinking more about the audience and a possible connection in The Conjuring universe, you know that what you’re watching isn’t worth watching. 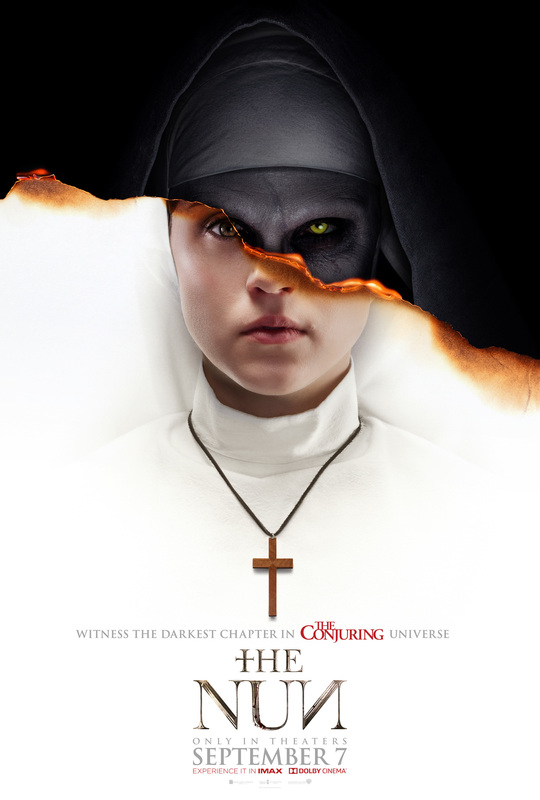 For all intents and purposes, The Nun is a generic horror film with little to recommend it apart from Farmiga’s performance and the occasional great visual. What I was impressed more than anything else was the subdued teenage group of viewers. How did they keep so quiet for so long? Why did the usher say to them to keep them quiet? Were they asked for ID as they bought their ticket? I’m sure these questions will never be answered. But I doff my cap to that god among men, that usher who managed to silence a large group of teenagers. Well done my friend, well done. VERDICT: 5/10. The Nun is another generic horror film, no better or worse than the last mediocre entrance in The Conjuring universe, Annabelle: Creation. It’s a bunch of jump scares hung together by nothing but Farmiga’s very good performance. AUDIENCE VERDICT: 9/10. This is how a modern day teenage cinema audience should watch a film! In silence! USHER VERDICT: 11/10. This nameless usher went above and beyond the call of duty. If I knew his name, I’d recommend him to the manager of Odeon Warrington for promotion. In this day and age, an usher of his magnitude is a rarity. What did you think of The Nun (2018) Leave your thoughts/comments below! This is one i’m still interested in seeing. I do think that when it comes to The Conjuring franchise, while nothing has struck me as entirely atrocious, the stronger entries tend to be directed by James Wan. When he steps down to elt someone else direct, it can be a little hit and miss for me.